Farm Town Bot - Farm Town Cheats, Secrets, Tips and more for Free. Farm Town Auto Bot is the software that can Auto Plow, Auto Plant and also Harvest. If you are on Facebook than there is no doubt that you are not aware of Farm Town game. The Farm Town game has really become popular very quickly because it is lively and interactive that draws game lovers to it. If you are looking for farm town cheats than you have to come to the right page. 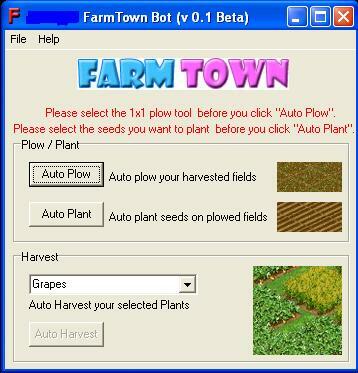 Farm Town Bot is the software that can Auto Plow, Auto Plant and Auto Harvest. ...... correctly or you don't have enough time to go through all the pain buy new seeds to plant and grow your own farm or to reach the highest level in the game. If you are looking for farm town cheats than you have to come to the right page as you will find more information about farm town cheats here. However, before we begin with the cheats and some tricks that you can use in the Farm Town game let me tell you that there aren't many farm town cheats available online because it is more of a social interaction game. Farm Town game on Facebook is really becoming one of the most happening games online because it requires social interaction and social support to win all the levels and obstacles. Farm Town Bot is just what you need to play Farm Town game on Facebook. just download Farm Town Bot to have a try now! PornBot will visit TGP's and MGP's and download adult movies and pictures. A Verbot&reg; can be your personal assistant, your teacher, and your friend. You are a Robot on a mission! TravianManager - Auto-Farm / Farm-Bot Software. Build units, buildings and more. Bulk website downloader. Download website from a starting URL, search results. Great playability, a high level of addictiveness and most of all, great fun. Qweas is providing links to Farm Town Bot 2010 as a courtesy, and makes no representations regarding Farm Town Bot or any other applications or any information related thereto. Any questions, complaints or claims regarding this application Farm Town Bot 2010 must be directed to the appropriate software vendor. You may click the publisher link of Farm Town Bot on the top of this page to get more details about the vendor.